Party Games by E.J. Greenway is an absorbing tale of the treachery and chicanery of UK politics. 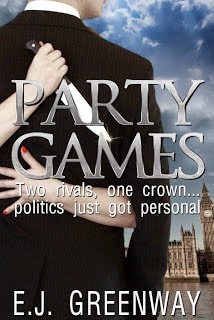 It’s a story with a ring of such authority, I found myself drawing parallels with real life politicians. Greenway clearly has a strong knowledge of Westminster, which draws the reader into a world they may not be that familiar with – I know I certainly wasn’t. In the beginning, Greenway introduces us to lots of characters and it’s a bit disorientating trying to keep track of names and titles but this is soon dispelled as the characters come to life and become plainly distinct from each other. The story starts with a shooting and then Greenway astutely takes us back in time, allowing us to see the build up to this defining event. What I liked about this novel is the way Greenway gives a human face to characters who, in real life, we often despise. Through Rodney Richmond, the recently elected leader of the Conservative party, we see how power can be a poisoned chalice as his position takes its toll on his relationships with friends. Anthea Culverhouse is a strong female character, sidelined despite the fact that she has been the force behind Richmond’s success. We see the bitterness of characters that have devoted their lives to politics, at the expense of everything else, only to see success snatched away from them. Not to mention the journalists stirring the pot to ensure their own influence. There’s no doubt that politics is a cut throat world and Party Games encapsulates this and then some. An intriguing story which will leave you wanting to read the sequel.